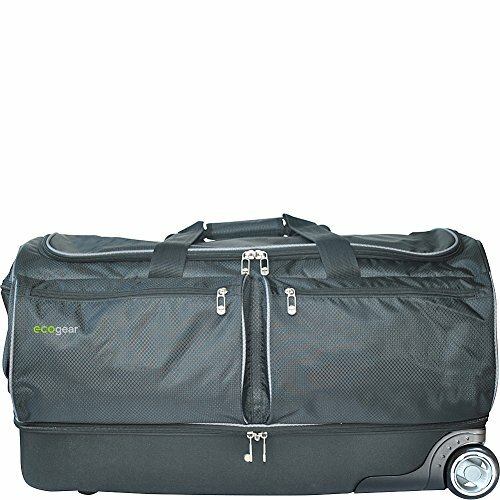 Roll into your next trip with the Ecogear 28" Wheeled Duffel! Convenient and innovative, this duffel bag includes a garment rack and can instantly convert into a mini closet, keeping your outfits wrinkle-free, accessible, and organized during your travels. With reinforced EVA side panels, the stability of the bag allows it to self stand when fully packed. The push-button telescoping handle and wheels make this convenient bag easy to transport while the reflective piping illuminates in the dark for added safety, especially in parking lots. The large rear pocket can hold a small folding stool, a convenient accessory for dressing rooms. With a clear top pocket for personalized ID or decoration, you will be able to keep track of your belongings. If you have any questions about this product by ecogear, contact us by completing and submitting the form below. If you are looking for a specif part number, please include it with your message.